At the age of twenty Tubby Hayes fronted an eight piece band built around him by Tito Burns. It played uncompromising modern music in the hard-swinging tradition of America's East Coast jazz groups, at ballrooms, concerts and US army camps and was well received by the public. The band had debuted on 1st April 1955 with a well respected personnel including Jimmy Deuchar, Dickie Hawdon, Mike Senn, Jackie Sharpe, Harry South, Pete Blannin and drummer Bill Eyden who was largely responsible for the bands tremendous drive. Although the band was a musical success it was only enthusiasm that kept it going through many periods of financial hardship. The band lasted little over a year and by the middle of 1956 Hayes had formed a quintet with Dickie Hawdon. Fortunately the band was recorded and the tracks have been reissued over several CDs. Tubby Hayes (ts), Jimmy Deuchar, Dickie Hawdon (tp), Mike Senn (as,bs), Jackie Sharpe (ts,bs), Harry South (p), Pete Blannin (b), Lennie Breslaw (d). Tubby Hayes (ts), Dave Usden, Dickie Hawdon (tp), Mike Senn (as,bs), Jackie Sharpe (ts,bs), Harry South (p), Pete Blannin (b), Lennie Breslaw (d). Sophisticated Lady(1)*"/I Let A Song Go Out Of My Heart(1)*/Deuces Wild*. Lennie Breslaw had left Ken Moule to join Tubby's band but the relationship did not last very long. Lennie later said of Tubby: A great talent, obviously, but he hadn't moved to maturity yet. He could be aggressive because he was on the booze and the other thing (heroin). Anyway, we got into some kind of argument about a number he didn't think I was making it on. He got aggressive and I got aggressive back. So that was that..." Tubby was only twenty at the time and Bill Eyden replaced Breslaw. Tubby Hayes (ts), Dave Usden, Dickie Hawdon (tp), Mike Senn (as,bs), Jackie Sharpe (ts,bs), Harry South (p), Pete Blannin (b), Bill Eyden (d). 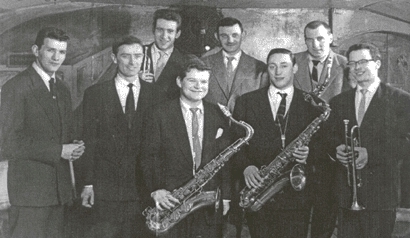 Tubby Hayes (ts), Mike Senn (as), Jackie Sharpe (bs), Ian Hamer, Dickie Hawdon (tp), Harry South (p), Pete Blannin (b), Bill Eyden (d). Orient Line(1)*/Plymouth Rock(1)(2)*/Room 608(1)*"/Sophisticated Lady(1)*/I'll Remember April(2)*/Doggin' Around(2)*/Mambo Tittoro(1)(2)*. This page was last updated during March, 2009.